If you'd like to personalize your account, you can add your name and a customized photo that will display on your reports. Go to Settings > Your Account > Your Details. Here, you can add your name as well as upload a photo or avatar. The name and avatar will then display on your account (on the app and website) when creating reports. If an avatar and name has not been personalized for the account, the default blue avatar and email address will display. An example of each is shown in the report below. This will show in other areas of the website as well, and should replace any instance you previously saw the full email address of this person. Did your name or picture update automatically? Here's why! We are always focused on user-friendliness and saving you valuable time. One of the ways we're doing this is by using a public API to pull in public data associated with your email address. This tool looks for a public account or profile associated with your email address (LinkedIn, for example). 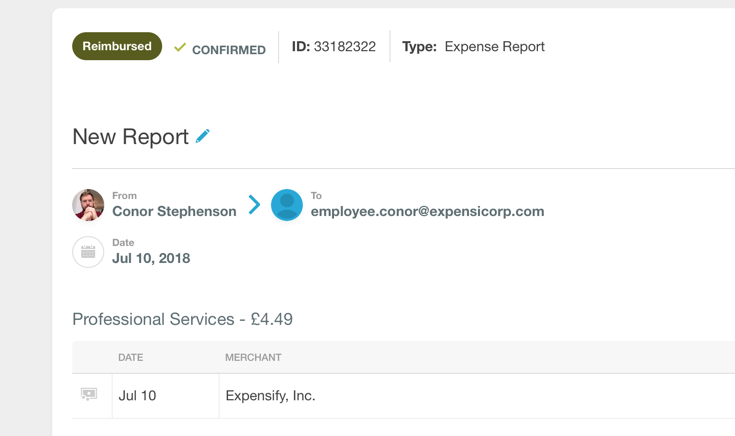 If it finds one, any uploaded profile picture and name will come in to Expensify. It's certainly possible that they are wrong in certain scenarios, and if so, we're sorry! Thankfully, it's a quick fix. You can manually make those changes using the directions above to get your information updated in a snap.